Nikon School is a venue for photography training that aims to educate and inspire. Their workshops cater for every level of photographic ability, whether you are a beginner, keen amateur or professional photographer. We joined them on their fencing experience day course to learn how to shoot better sports portraits. Throughout the day we were shown, alongside a handful of other lucky people, how to shoot explosive action shots, static sports portraits, and how to utilise the settings in our Nikon to capture the absolute best results whilst shooting with continuous LED lights. So let’s dive right in and look at what we learnt. Before you get shooting, you'll need to dial in some crucial settings. Fencers are well-known for their explosive speed, so we needed to ensure we could freeze the motion as they moved. We switched to Manual mode and used a fast shutter speed of no slower than 1/400 sec to do this. We also wanted to separate our subjects from the background, so opted for a wider aperture of f/4 – that way we could retain a depth of field that would keep the fencers in focus, but allow the background to fall out of focus. Auto ISO was useful for maintaining a balanced exposure as the athletes moved closer to, and further from our light sources, and our D850 did a fantastic job. Neil Freeman, our trainer for the day, set up two Rotolight Aeos LED lights camera-left and camera-right of our subjects. This had the benefit of both lighting the front of each subject, but also adding a back-light against the other, as the light skimmed past them both. A crucial part of making any kind of photograph, is balancing colours in the scene. Neil demonstrated how we could adjust the white balance on the Rotolights we were using. This allowed us to match the colour of the ambient light that softly poured in from the skylight windows in the ceiling. By adjusting the white balance in-camera we could render accurate colours, essential to making the iconic white outfit appear white. There are no rights or wrongs in photography, and we were encouraged to seek fresh shooting angles. Some chose to shoot from a low vantage point, whereas others jumped up on the benches to get dramatic aerial shots. We were even able to direct the athletes to produce engaging action portraits that seemingly interact with the camera. 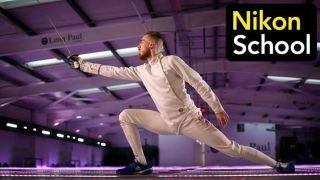 Fencing has an easily recognisable look, the white outfit, protective head gear, gloves and of course the weapon itself. Sometimes the clothing is branded or decorated to identify the athletes, so take a moment and capture these details. Using a single light source to one-side of the camera we can cast shadows across the subjects for added texture. Use a wide aperture here to help place focus on the detail. Ask your trainer how to improve your images. The real benefit to attending this course, as well as the exclusive access and opportunity to shoot some world-class action portraits, was the excellent tuition on the day. We were able to get instant feedback from the trainer, which was invaluable to drastically improving our photographic technique. Neil was able to give us suggestions for camera setting tweaks and came up with creative ideas that none of us thought of, but also gave us the room for experimentation to try out our own ideas. Why not book onto your own Nikon School course? Whether you're a beginner wanting to learn their camera for the first time, or a pro that wants to brush up on a few things, head over to the Nikon School site to book in for your own course, just visit Nikon School's website . If you'd like to book on your own sports photography course, visit Nikon School's sports photography page. You can read more about this shoot in issue 93 of N-Photo magazine, on sale 20 December 2018 available in all good stockists. You can even buy it online in print and digital editions on My Favourite Magazines.